I am happy to say that I managed to keep up with my exercise over the holidays! The end of December is notorious for excessive eating, drinking and vegging out – all of which I am admittedly guilty of. However, this time around I did not fully neglect my body. Throughout any kind of fitness journey, we all must remember that it is OK to spoil yourself now and then. Countless times over the last two weeks I heard people say they couldn’t eat this or that because they “always gain weight over the holidays”. Umm, hello? We all do. It’s normal! Multiple occasions filled with socializing with family and friends over holiday snacks, meals and drinks are crammed into one week and they are not typical of our regular diet. Unless you are used to mimosas, baked brie and holiday cookies on a daily basis (invite me over), of course your body is going to react differently! Two of my holiday gym workouts were nothing short of loco. I typically have designated muscle days – one day will be squats, lunges, leg presses, etc. another will be shoulder presses, military presses, front raises, etc. – but I just went at everything. One day I did shoulder presses, curls, military presses, bench presses, a few ab workouts, squats and lunges. I attempted a post-lifting run and pretty much ran two steps, laughed at myself for even trying and crawled to the locker room. So, rather than depriving myself of or kicking myself for having that holiday treat that I really truly wanted, I just made some time to squeeze in my runs and gym trips. When I couldn’t do either of those, I improvised at home. I not only allowed myself to enjoy myself, but I also felt much better. My other crazy workout was similar in that it had a lot of variety, but I targeted different muscles and tried some lifts that I don’t do very often, such as pull ups and dips. I used to do those on a regular basis and now I almost never do. Oh, and yes… that IS 270lb leg press, thanks for asking. Multiple sets of 10 reps – cake! Pretty soon I will be adding more plates! I made a trip to Montreal between Christmas and New Years with my family. Obviously we had a lot of beer and poutine (which, by the way, is unbelievable). My body hated me after that poutine, but it was so worth it. 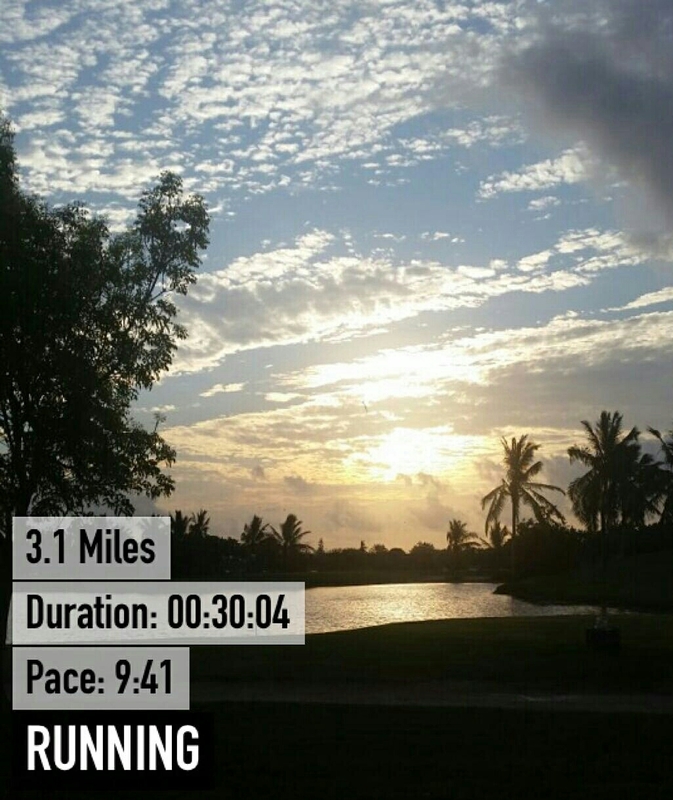 One morning while everyone was still asleep, I rallied myself out of bed and went on a quiet run. I almost didn’t go because it was freezing and I was exhausted, but I told myself that I would regret it later if I skipped out. The streets were absolutely dead – I saw maybe three or four cars drive by – and totally slushy from some overnight snow accumulation. Despite the conditions of the roads, it was awesome, peaceful and felt great. 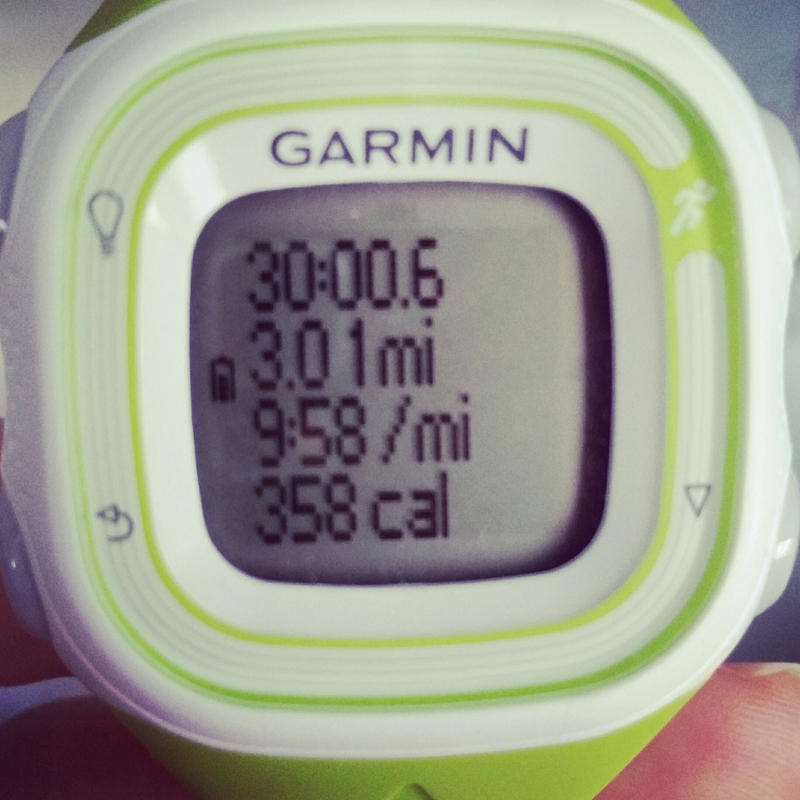 I wasn’t running for time, wasn’t looking to maintain my average pace… I was just running. I went just under 3 miles and shockingly came in just about 20 seconds more per mile than what I typically do. I thought for sure it would be much slower as I was slipping and sliding and navigating my way through unfamiliar streets. Along my way I came across a beautiful cathedral which was a nice find, and it was really cool to check out the neighborhoods and cafes along the way. You can always make time for exercise! No excuses! 27:23 Time; 8:49 per mile pace; 1002 place out of 3522 runners. 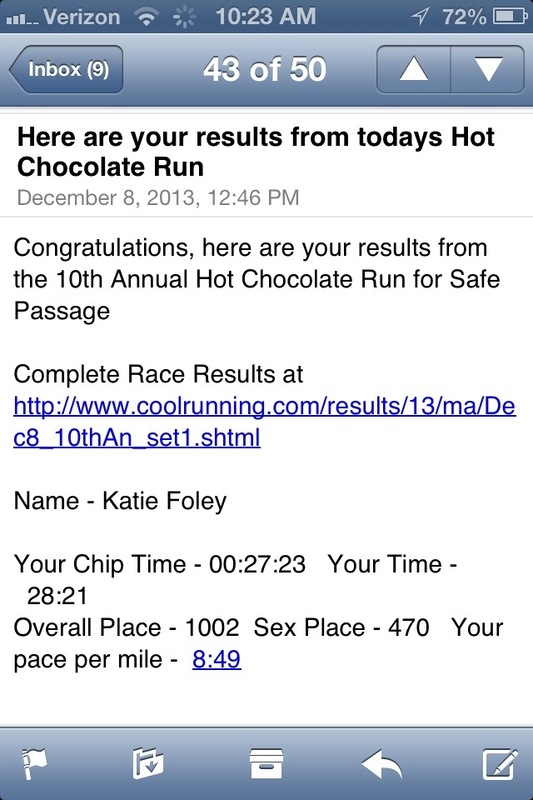 The Hot Chocolate 5k for Domestic Violence has come and gone and I am pretty satisfied with how I did. Considering the hills and how FREEZING it was (about 20 degrees I believe), I was hoping to come in under 29 minutes and surpassed that by more than a minute and a half! For weeks I had been telling my brother (who runs cross country and completed the race with 7 minute miles last year) that if he felt like I was going too slow for him then he shouldn’t feel like he has to stay with me. However, he made the decision to run with me the whole time despite the fact that he could do better, which I was very grateful for. He talked me through the whole thing and was an awesome coach! Whenever I felt like I was getting tired, he would motivate me to go faster. When I was running a good pace, he would tell me I was doing a great job and to keep it up. When we passed the 1 mile and 2 mile marks, he would let me know whether or not we needed to pick up the pace in order to break 30 minutes. Little did I know, we were well below 30 and he was just trying to help me do my best! I planned to run with my ipod to keep track of my time using my Nike app, but I was convinced not to so that I don’t obsess over my times throughout the race. So glad I didn’t! I was able to focus on my stride and pushing myself without freaking out if the Nike lady came on in my headphones to tell me that my average mile was higher than what I wanted. After the 3rd or 4th hill (I was told there was only one. Lies! ), I had a brief moment when I thought I wasn’t going to be able to finish well. My brother told me how close we were to the finish line and we BOOKED it. I have no idea where that last burst of energy came from, but we sprinted the last .3-.5 mile like nobody’s business. I felt so great after the race, and so proud that I beat my last 5k time by probably 6 minutes. Now to register for another! Does anyone know whether the treadmill or Nike+ is more accurate? I ran on the treadmill at the gym yesterday and used my Nike+ chip as backup for tracking my time and distance. Nike told me that I went .21 further than the treadmill did, with my average pace being 8:34 and my best mile being 8:24, while my treadmill mile was 10:26. 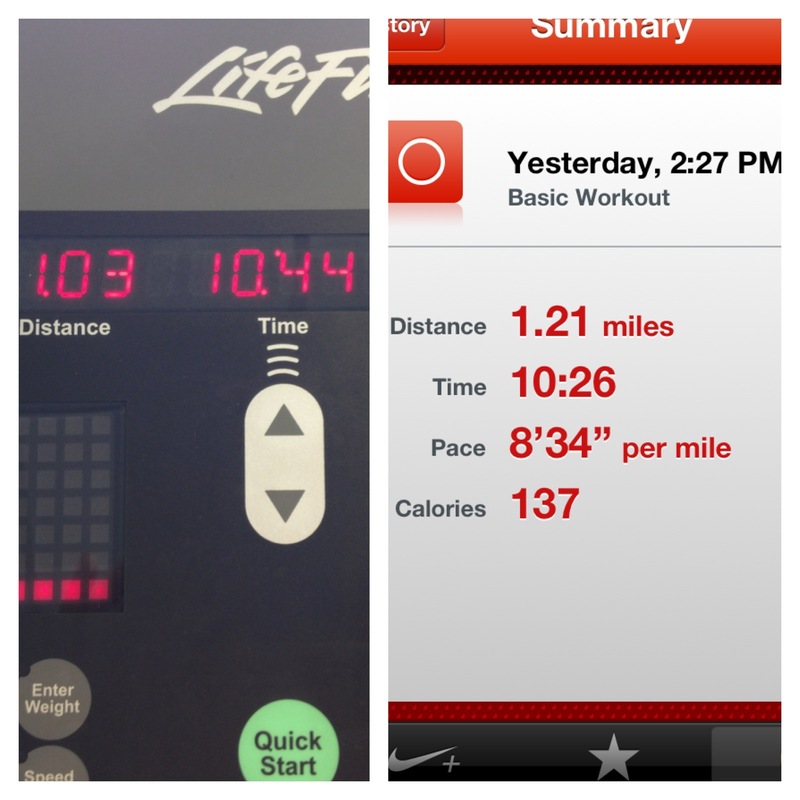 I ran until I hit a mile on the treadmill just to be sure that I actually completed the distance I wanted – if I went a little further, great. However, I am unsure which device is more accurate than the other. 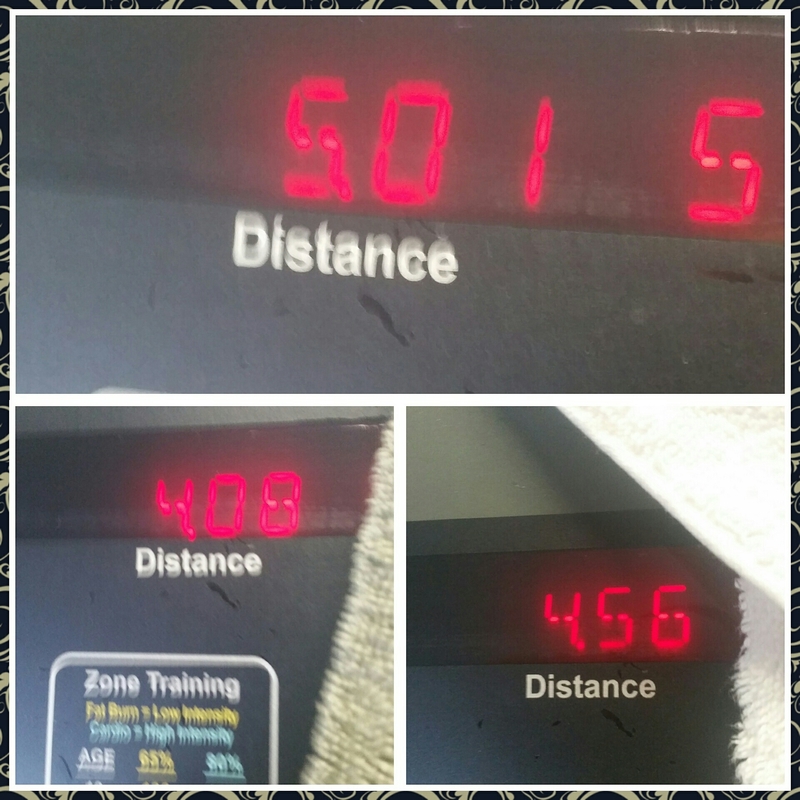 Because I am training for another 5k (and hopefully something bigger down the road), my times are important to me! I’d like to think that Nike+ is more accurate (obviously I would LIKE that), not only because my mile is better but because my time is more in line with other runs I have done. The day before yesterday I ran outside using the chip and it told me that my pace was 8:48 per mile. I have also done other runs using MapMyRun and GPS, and the Nike times are closer to those than the treadmill is. Now, I am POSITIVE that I was running faster yesterday (treadmill) than I was the day before (outside). This leads me to believe that between my Nike+ and MapMyRun data, the apps are more accurate than the treadmill. But how can I be sure? Has anyone else experienced this, or have any insight as to which is more trustworthy? I understand that treadmills are calibrated to measure your speed and distance using the belt and that Nike uses the sensor to calculate your stride, but I don’t understand how there could be such a large difference. My brothers who are both runners have always told me that your time on foot will always be better than on a treadmill, but I wasn’t expecting this!